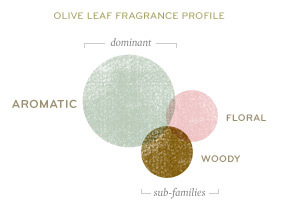 A uniquely modern fusion born of antiquity, Olive Leaf uses every part of the olive to create a holistic, whole-body experience. Fresh herbs of rosemary, Sardinian laurel leaf and balsamic lavender flowers bask in Mediterranean sunshine. Below, rich, earthy notes of European patchouli balanced with crisp balsam and herbaceous rosewood harmonize and ground. Perfect for men and women. Warm and welcoming, a light mist of this eco-friendly, low VOC room spray does more than simply scents the air; it becomes a fragrant backdrop for enriching your life. A pure and wholesome interpretation on standard air fresheners.